Geo- and Eco-Mapping around DRI (The Great Altered Rock Walking Tour) [link download pdf], 2014, E-55, NBMG: around DRI. Mapping the Geology around the Desert Research Institute and Truckee Meadows Community College [pdf], ESW 2013, E-53, NBMG: around DRI. "Tuff All Over": Exploring Faulted Volcanic Terrain in the Painted Hills, Virginia Mountains, West of Pyramid Lake [pdf], ESW 2012, E-52, NBMG: near Pyramid Lake. 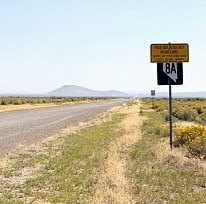 "Life's a Beach": In Search of Ancient Shorelines and Volcanoes in the Grimes Point and Lahontan Mountains Area [pdf], ESW 2011, E-51, NBMG: near Fallon. Geo-tripping in Nevada [pdf], NBMG map guide to many or most of the NBMG field trip guides in Nevada through E-50. In search of Tufa, Tuff, and Tough Rocks [link to download pdf], ESW 2010, E-50, NBMG: stops are east of Pyramid Lake; trip guide includes Reno to Pyramid Lake, Pyramid Lake to Wadsworth, Pyramid Lake to Brady's Hot Springs, Brady's Hot Springs to Reno. Digging Deeper into the Comstock [pdf], ESW 2009, E-48, NBMG: Reno to Gold Hill. No Child Left Inside: A field trip for Families and Rockhounds [pdf], ESW 2008, E-47, NBMG: stops are near Fallon, east of Fallon, north of Fallon, and in the Truckee River Canyon along I-80; road guide runs from Reno to east of Fallon, Fallon to Trinity (junction of I-80 and 95), and Trinity to Reno. Taking the Pulse of the Earth [link to download pdf], ESW 2007, E-46, NBMG: south of Reno (Slide Mountain, Steamboat, and Virginia Foothills; the latter two not available to public). The Frenchman lake frolic [link to download], ESW 2004, E-43 NBMG: Frenchman Lake area, California, west of NV-CA border. Get out, stay out, and stay alive [link to download], ESW 2003, E-42 NBMG: north of Reno towards Pyramid Lake. In search of "the right tuff" but you can just "take it for granite" [link to download], ESW 2002, E-41 NBMG: north of Reno and to the west toward northern end of Red Rock Road. Fossils and Ancient Lakes [link to download pdf], ESW 2001 field trip #2, E-40, NBMG: fossils near Nightingale. Peavine Peak: Geology, plants, and mining history [link to download], ESW 2001 field trip #1, E-39, NBMG: Peavine. Exploring east of the summit: A field trip guide to Steamboat Springs, Lake Tahoe, and the Comstock area [link to download pdf], ESW 2000, E-38 NBMG: Steamboat Springs, Lake Tahoe, Comstock. Geology along America's loneliest highway [link to download pdf], ESW 2000 E-37 NBMG: Carson to Sand Mountain. What's shakin' in the neighborhood? -- Road log [link to download pdf], ESW 1999 field trip #2, E-34 NBMG: Reno, Mt. Rose fan/pediment, to Genoa fault scarp. Turbulent times in the Truckee Meadows [link to download pdf], ESW 1999 field trip #1, E-33 NBMG: UNR to Verdi to Crystal Peak Mine. Ancient lakes and volcanoes near Fallon: Field trip for families and rockhounds [link to download pdf], ESW 1998, E-28 NBMG: Fallon, Grimes Point, Soda Lake. Link to NBMG's entire Educational series; most (all?) are available to download. Sign near the junction of old Highway 8A and Highway 50, near Austin, Nevada. Highway 8A is now S.R. 305 going north to Battle Mountain and S.R. 376 going south to Tonopah. © 2006-2019 Looking for Detachment. All Rights Reserved.. Powered by Blogger.